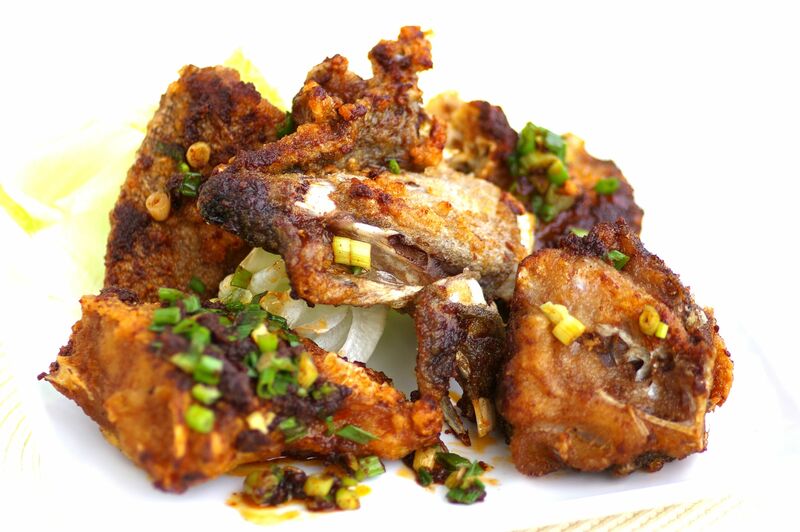 The Pepper and Salt Fried Fish Head is a quick and tasty dish. Rinse the fish head, cut into pieces and pat dry. Coat fish head pieces in the tapioca flour mix. Heat enough oil for deep frying in a wok. When hot, deep-fry the fish head over high heat until cooked, golden brown and crispy. Drain on paper towels and set aside. Remove most of the oil, leaving just 2 tablespoons oil in the wok. Add in the aromatic garnish and stir-fry briefly over medium heat until fragrant. Add the prefried fish head and seasoning. Stir-fry briskly over high heat until well combined.